On the password entry screen, enter 135-792-468 and with the cursor on the final number press A + B + SELECT. You will begin the Another World Circuit, a secret circuit that can only be reached using this password. On the password entry screen, enter 106-113-012 and with the cursor on the final number press A + B + SELECT. You can now watch the staff credits for the game. On the password entry screen, enter 800-422-2602. The game will play back a phone busy signal. 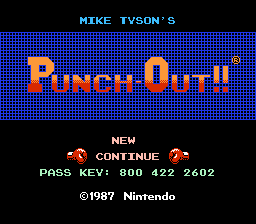 This password was actually Nintendo of America's old Customer Service phone number. Mario appears as the referee in the game. He appears to start the fight, count down to K.O.s and announce the winner. "Join the Nintendo Fun Club today! Mac." The Nintendo Fun Club was a U.S. fan club run by Nintendo of America with a quarterly newsletter released from early 1987 for seven issues before being revamped as Nintendo Power magazine. 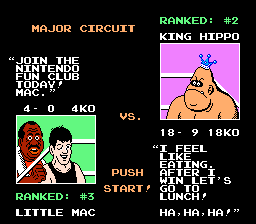 This cameo is lampooned in Punch-Out!! (Wii), where Doc starts uttering the line before changing it to "Club Nintendo".